To throw light upon the odorous memories and to work for obtaining the items of such memories; these two things cast on souls good manners, virtues, and acquaintance with the conducts of the past personalities who were characterized by high merits, piety, righteousness, and decency. Thus, the noble, deep-rooted character of Lady Zaynab should not be passed over because she has contained all points of immaculacy, majesty, dignity, and distinguished origin. She has also possessed renowned bearings in the fields of perseverance on the principles, courage, eloquence, and full-heatedness in addition to asceticism, chastity, piety, holiness, and magnanimity. On that account, it is necessary for seekers of merits and fact-finders to adopt from her precious life account and please the ears by listening to her admirable, odorous memories so as to take from her a model of self disciplining, knowledge, and aspiration. Lady Zaynab enjoyed the most exalted lineage since she ramified from the tree of prophecy and Imamate and combined all the elements of honor and dignity. The family of Imam 'Ali (AS) has been the most elevates all over history in fields of struggle against wrong and adaptation of the issues of human rights. For the sake of these issues, sons and descendants of Imam 'Ali (AS) have provided hundreds of martyrs. Lady Zaynab's grandfather, from the maternal side, was Prophet Muhammad (p.b.u.h) who exploded spring of knowledge and wisdom on this earth, founded the features of civilization and development, constructed a noble society controlled by justice and law, smashed the customs, superstitions, and pagans of the savage, tribal society that prevailed in the Arab Peninsula, called for worshiping the One Creator, and brought to his nation abundant goodness. Indeed, Almighty Allah sent Prophet Muhammad (p.b.u.h) as mercy for humankind. From this great personality, Lady Zaynab inherited defense of the right and struggle for elevating the Word of Allah highly. Her grandmother, from the maternal side, was Khadijah who supported Islam in its darkest days, struggled for sake of Allah in the ever-best way, and spent her entire fortune for sake of her religion. She therefore has been one of the two supports on which Islam relied in existence. The Prophet (p.b.u.h) used to appreciate for his loyal wife her situation in her life and after her death. From this great grandmother, Lady Zaynab inherited the highest moral standards and perseverance on principles. Copying her grandmother, she supported her brother, Imam al-Husayn (AS), in his revolution and supplies his great uprising with elements of eternity. Lady Zaynab's father is Imam 'Ali Amir al-Mu'minin (commander of the faithful believers): chief of the prophets' successors, leader of the pious ones, and head of the worshippers. 'Ali was the representative, successor, and heir of Prophet Muhammad (p.b.u.h). His merits are innumerable and his situations for sake of Allah are incomparable. He was the most knowledgeable, the most self-possessed, the most magnanimous, the most generous, the most ascetic, the most courageous, the most reputable, the best worshiper, the most loyal, the most faithful, and the most pious among Muslims. Historians have recorded unanimously that Lady Zaynab was imitating her father in behavior, knowledge, and conduct. She, too, adopted positively all of her father's goals and situations for sake of supplying Islam with elements of continuity. Hence, she, along with her brother Imam al-Husayn (AS), could thwart the Umayyad infidels' plots aimed at wiping out Islam and replacing it with the pre-Islamic customs. Lady Zaynab's mother was Lady Fatimah al-Zahra' the Veracious (AS) who was a copy of her father in adoration of Allah, piety, self-discipline, knowledge, virtue, clemency, veneration, and the other features of perfection. Her father named her as the Chiefest of the Women of the World. (1) From this cause, her father addressed his best words of laudation and respect to his daughter who was the ideal woman on this earth. Besides Prophet Muhammad (p.b.u.h), Fatimah al-Zahra' the Veracious (AS) was praised by everyone who lived in her time Ibn Hajar al-Asqalani, in his al-Isabah, records that 'A' ishah, the Prophet's wife, said: "Except Prophet Muhammad (p.b.u.h), nobody is preferred to Fatimah." 'Abdullah ibn'Abbas said, as it is recorded in the previous reference book: "The best women of Paradise are four: Khadijah, Fatimah, Mary, and Asiyah -the Pharaoh's wife,"
Al-bukhari, in his al-Sahih, and Muslim, in his al-Sahih, recorded the following: Al-Musawwir ibn Makhramah quoted the Prophet (p.b.u.h) saying, "Fatimah is a piece of me. Whatever hurts her is certainly hurting me and whatever please her is certainly pleasing me." 'Ali (AS) reported the Prophet's addressing to Fatimah: "Fatimah, most surely Allah is pleased when you are pleased and enraged when you are enraged." Finally, reference books of Islamic history and narration are full of reports relating the elevated standing of Fatimah al-Zahra' the Veracious (AS). This was the mother, educator , and instructor of Lady Zaynab who was nourished on all features of human perfection. Abu Talib, father of Imam 'Ali (AS), was the protector of Islam as he defended Prophet Muhammd (p.b.u.h) so bravely and suffered in this course unbearable troubles. Only under the guardianship of Abu Talib could Prophet Muhammad (p.b.u.h) propagate for his divine mission and spread his principles rearlessly. With the demise of his protector, the Prophet (p.b.u.h) expressed his great loss and grief. He therefore called that year as 'year of grief'. After the demise of Abu Talib, the enemies of the Prophet(p.b.u.h) agreed on assassinating him, but Allah saved and ordered him to flee to Yathrib and let his cousin, 'Ali, sleep in his bed for making the assassinators understand that he was still there. From this great personality, Lady Zaynab drew the best lessons of defending the principles. 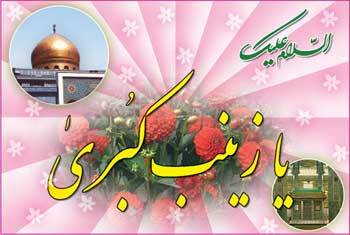 Lady Zaynab's grandmother was Fatimah bint Asad; an example of faith and purity. On her hands, the Prophet (p.b.u.h) was brought up and treated so kindly and tenderly since she used to take care of sympathy and love. Hence, she was highly respected by him; when she departed life, he (p.b.u.h) dressed her his own shirt and laid down in her grave as expressions of his great love for her. From this great mother, Lady Zaynab learnt the best lessons of love and support for sake of her religion and its legal leaders. We, also should not neglect the fact that Imam al-Hasan and Imam al-Husayn (AS) participated in composing the unparalleled personality of their sister, Lady Zaynab, since she spent a long term of her life under their custody. Lady Zaynab imitated the morals and ethics of Imam al-Hasan (AS) who was known of his composure and liberty in addition to all the high moral standards. As he noticed that his grandfather and parents take care of Zaynab, Imam al-Hasan encompassed her with very much love and compassion and preferred her to the other harem of the Prophet's household. Imam al-Husayn's realtion with his sister Zaynab has been the melody of seekers of human perfection. She could occupy his feelings and emotions for the genuineness of her estimation, elevation of her ethics, and high moral standards. She was the most dependable in the sight of Imam al-Husayn (AS) who used to take counsel with her in all of his affairs. She also accompanied him in all the stages of his revolution. without Lady Zaynab's struggle, efforts, and honorable situations, the revolution of Imam al-Husayn (AS) would have been lost. As an example of Lady zaynab's great standing in the sight of her brother Imam al-Husayn (AS) is that when he bade her the last farewell on the day of 'Ashura' , he asked her to mention him in her Night Prayer.